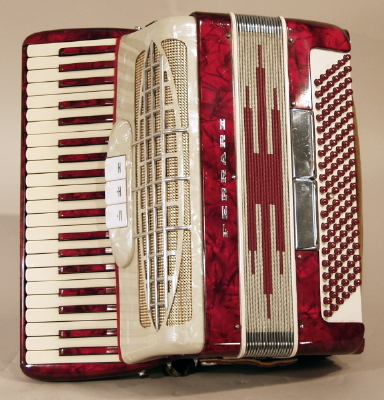 Ferrari Keyboard Accordion, c. 1960's, 3 octave, made in Italy, red pearloid with white trim finish, original black hard shell case. Height is 15 1/2 in. (39.4 cm. ), 15 1/4 in. (38.7 cm.) width. Excellent + Condition.